The Conservative Bible Project (CBP) is done with the Gospel of Mark. And I think they've done a fabulous job! Jesus was talking about grape juice here, not wine, as the note for this verse explains. 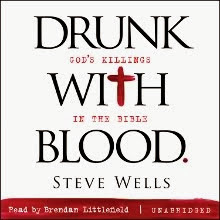 So drinking wine is wrong and Jesus sure as hell never drank any. But if that's true, why does the CBP say that Jesus changed water into wine at the wedding at Cana? Shouldn't that be grape juice, instead? So I guess Jesus messed up here. Oh well, nobody's perfect. I have heard of the grape juice thing before but doubt the ones writing this would want to be agreeing with the mormons on this. If I remember correctly there were several times in both the OT and NT that people were drunk and all. Guess these happened before they knew how to properly do the grape juice. Generally, the people who deny that Jesus ever drank wine will claim that this is also only grape juice. After all, the word in that passage is still oinos. It seems pretty obvious from context we're talking about alcoholic beverages, though; it's just like in college when we'd have a party and we'd buy a case of good beer and a case of crappy cheap beer for after everyone was too soused to care. Also, 1Titus 5:23 only makes sense if it's talking about alcoholic wine. Well here's the thing. There was no unfermented grape juice before Louis Pasteur. The Mormons, and other conservatives have it wrong. It's only so they don't have to suffer the embarrassment of telling their kids that Jesus was a drunk. As we all know, as far as juice is concerned, the newer (fresher) it is, the better. That is unless, of course, you are talking about the fermented stuff! In the Cana story, why would the host serve the good wine/grape juice first, and leave the poorer till last? Obviously because the guests are getting drunk, so they don't care how good it is any more. Initially I was raised Seventh-Day Adventist; around 3rd/4th grade my father was questioning his faith, the church, and the elders. For those not familiar with this schism of Christianity, it incorporates additional Jewish traditions into their religious practices. Most notably they keep the Sabbath (from sundown Friday to sundown Saturday), take Kosher to an extra level by eating no meat, and prohibit all alcohol consumption. My father told me of a time during his 'questioning' that he queried the church elders about Jesus drinking wine and eating lamb (because Adventists do not drink alcohol or eat meat); the church elders insisted that the wine was really grape juice and the lamb was only used for sacrifice and not really eaten. He then pressed further, pointing out that Passover is in the spring, so there would be no fresh grapes; and any grapes from the previous year’s harvest would have started to ferment. So the elders further insisted that the juice was made from reconstituted raisins. Seriously!? Have you ever tried to reconstitute dried fruit? Let alone make juice from that? LOL! Number One, Brucker, you mean 1st Timothy, not 1st Titus. Good reference, though, very fitting. Revelation 22:18-19 would also be a good reference for this situation. It probably is meant only to directly apply to Revelation, but I believe the spirit of it is true of all Scripture. Number Two, I'm a Christian and I sincerely want to thank you all for reporting on this "project." The CBP gives all Christians a bad name by being illogical, contradictory, and in an unkind spirit. Moreover, most of his changes are as senseless as they are unsupported by Scripture. The Pharisees and Scribes were the most conservative groups in the world at the time of Christ, and calling them Liberals is offensive, false, and ridiculous. Thank you all for helping intelligent Christians expose the rest of us. dmcmillon "Moreover, most of his changes are as senseless as they are unsupported by Scripture." Clearly not. Since Jesus was a conservative Baptist, the Holy Spirit must be infallible at ferreting out the sneaky liberalese that sneaky Liberals snuck in to His Word. Ergo, Conservapedia, the Wiki that Jesus can edit® must be on the right track. Their logic is unrefutable. "The Pharisees and Scribes were the most conservative groups in the world at the time of Christ, and calling them Liberals is offensive, false, and ridiculous." Ah, but they weren't as conservative as True Conservatives, making them by definition really Liberals, in fact. At most, they'd be RINOs, which aren't real Conservatives at all. Also, "Offensive, False, and Ridiculous" is Conservapedia's motto. True story.